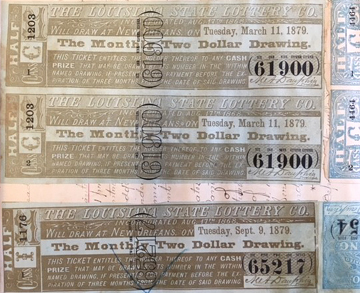 Until 1816, when legislative authorization was required, anyone in Kentucky could conduct a lottery to raise money for public improvements such as a church, school, road or bridge, or just to fund some private scheme: only a year earlier, John A. Grimes of Madison County had parted with his property by holding a lottery and charging $20 per ticket. Even with the introduction of legislative oversight, the history of lotteries is rife with tales of fraud and corruption. Former WKU librarian Mary Leiper Moore researched the story of James R. Golladay of Bowling Green, who ran a number of high-rolling lotteries in the 1870s; prizes included $10,000 in cash, a brewery, houses and lots in Louisville and Bowling Green, and various smaller awards of cash, horses, and carriages. Golladay’s empire collapsed in controversy, however, after the winner of a “handsome residence” in Bowling Green turned out to be. . . his own wife. The Manuscripts and Folklife Archives of WKU’s Department of Library Special Collections include other materials relating to this strike-it-rich pastime. There’s a ticket for the “Great Land Sale” in Henderson County, held in 1870, where four substantial prizes of good “river bottom land” and cash were awarded. There’s the scrapbook of Captain Richard Vance, a devotee of the Louisiana State lottery who apparently never threw away his tickets. And there’s Kentucky’s first state lottery ticket, issued in commemorative form in 1989. Click on the links to access finding aids for these collections. For more, search TopSCHOLAR and KenCat.